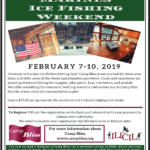 Marines and Veterans will enjoy the Perfect Fishing Spot! Camp Bliss is surrounded by three area lakes and offer some of the finest opportunities anywhere. 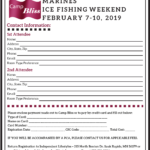 Come and experience an amazing weekend fishing for crappies, pike, perch, bass, northerns, and sunfish. We offer something for everyone! Nothing warms a cold winter day at Camp Bliss like the warm smile of a successful ice angler! Cost is $75.00 per person for the weekend and includes lodging and meals. The cost to send 1 Veteran to Camp Bliss for a weekend retreat is $400, which includes lodging and all meals. Because of donations/sales from our 2018 Guns and Goods Raffle, we are able to supplement $325 per Veteran, up to 50 Veterans.